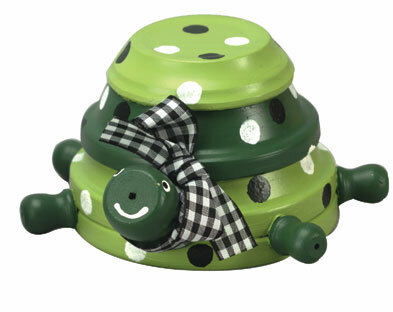 Add this whimsical green turtle to your outdoor decor or garden with terra cotta saucers. Americana Brushes DBF2575-B - Flat 3/4"
Using adhesive, glue inside of 4-1/2" saucer over bottom of other 4-1/2" saucer. Glue inside of 4" saucer rim over base of 4-1/2" saucers. Glue inside of 3-1/2" saucer over base of 4" saucer. (Refer to photo for placement.) Allow adhesive to dry thoroughly before painting. With 3/4" flat brush and Citrus Green, paint top and bottom saucers, allowing to dry after each coat. Use 1/2" flat brush and Sprout Green to paint middle saucer; allow to dry after each coat. Use 3/8" pouncer and Wrought Iron Black to paint dots on turtle body by pressing pouncer into paint on plate; repeat with Warm White. Allow to dry. Use 1/2" flat brush and Sprout Green to paint all wood pieces; allow to dry after each coat. Use lo-temp glue to attach head, legs, and tail of turtle to body (refer to photo for placement). Fill in gap between neck and body with glue as necessary. Use end of brush handle dipped in Warm White to paint eyes; use liner brush to paint smile. Allow to dry. Glue center of ribbon under neck and wrap ribbon around neck. Tie ribbon into bow at side of neck and trim ends. This is such a cute little guy. I live in a garden apartment. There is a front patio enclosed with a wooden privacy fence. I have some rocks, solar lights and gnomes in there. Thus little guy would really brighten it up. Thank you for the great idea and inspiration. WOW. This little guy is so cute and will be a great addition to any garden or even a fairy garden. You can adjust the size of the turtle by the terra cotta saucers you get. Pick out any color of your choice and decorate any way you want. Maybe even put a ribbon on head for a girl turtle or even put a small terra cotta planter on top with a succulent in it. Great tutorial for such a pretty piece. where can I find the 4 1/2 inch saucers? I've looked everywhere I can think of. Please help! I love this turtle! My grandkids will too.I will make this with them.Thanks! for such a great idea and so simple for the kids to do. Love any type of turtle projects, as my 5 year old grandaughter is in love with all turtles. Due to her grandfather has given her nickname "Turtle" her room is decorated with all types of turtles. Indoor or outdoor designs, it doesn't matter. The fact that she can design them herself is great, for she has a great imagination, and take great pride in her work. This is something to keep us both occupied, as she practicley lives at our house and has her own room here. I found the wooden oval and candle cups at Hobby Lobby. I'm also having a hard time finding the right sizes of saucers. As far as I can tell they don't exist. Found a 4.25" at Walmart. No luck on the others. I've noticed a lot of the craft ideas they offer have components that are not easy to find. What's the point if you have to hunt all over the city for parts? Discouraging.